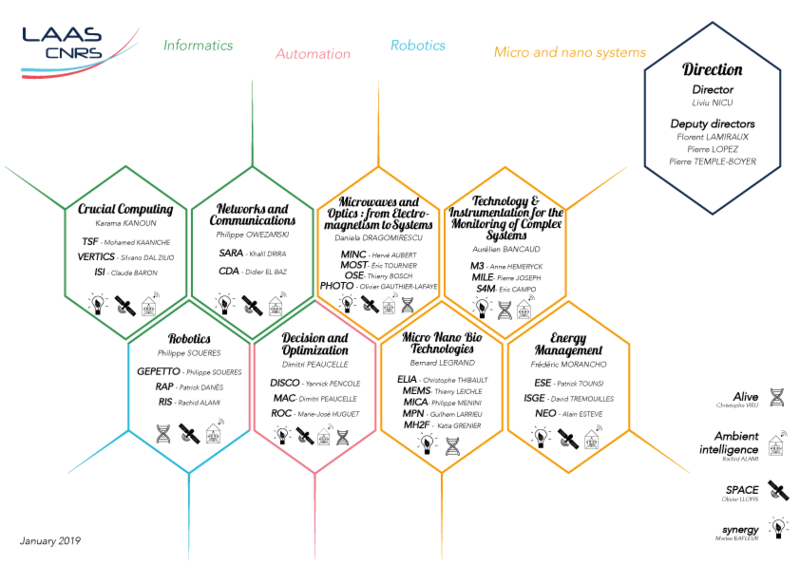 To anticipate the interdisciplinary challenges of emerging and future systems and services, LAAS-CNRS identified four strategic axes : Adream, Alive, Synergy and Space. They are based on the four major disciplines that have been the hallmark of the laboratory since its inception: computer science, robotics, automatic control and micro and nano systems. Within these disciplines, research at LAAS revolves around 8 scientific departments running 26 research teams, basic units of research at the laboratory. LAAS works on various types of systems: micro and nano systems, embedded systems, embedded systems, distributed large-scale systems, biological systems, mobile systems, autonomous systems and critical infrastructures, with application areas such as aeronautics, space, transport, energy, services, health, environment, telecommunications, manufacturing and defence.